Powers/Abilities: Good fighter. Uses a microphone in his costume to amplify his voice to scare his enemies. History: (Daring Mystery Comics #7,8, g.a.) Frustrated that America didn't seem to be dealing with crime or Nazi saboteurs, radio operator Jerry Carstairs created a costume with a built in microphone, and went out to fight for justice as the Thunderer. 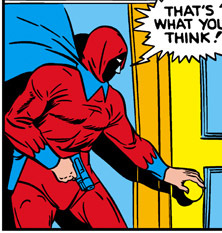 (All-Winners Comics #6) The Thunderer briefly changed his name (but not his costume) to the Black Avenger. (Marvel Premiere #29) The Thunderer posed for a newspaper picture alongside a number of other American based heroes. (Marvels #1) Alongside a number of other heroes, the Thunderer patricipated in an air drop on a Nazi stronghold. (Captain America #442) The Thunderer attended a reunion of Second World War costumed heroes. Powers/Abilities: The Thunderer has a sonic scream, capable of deafening people or bringing down entire buildings. History: During WW II the Thunderer fought alongside a number of other heroes. When Captain America vanished near the end of the war, apparently disintegrated in the middle of a struggle with the Red Skull while standing on a weapon the villain had invented, the five other heroes present vowed to see no one else would ever use the weapon. Each hero took one of the keys to the base, and then they retired, scattering across the country to make the keys harder to gather, and being forgotten by the general public. In the modern day, the Kingpin led a group of criminals in trying to gather the keys, and hunted down each of the "Six Forgotten Warriors". The Thunderer was the last one to be located; ironically he had stayed closest to the base, determined to guard it, and disguised as a down-and-out. The gathered heroes allied with Spider-Man to stop the device being activated, but when it was turned on, it reintegrated both the Red Skull and Captain America, albeit temporarily. Afterwards the heroes returned to their retirement. Comments: An interesting revival of Golden Age characters happened in the 1990's Spider-Man cartoon. 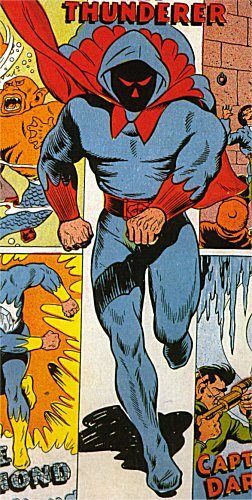 At the time of the cartoon airing both the Thunderer and Black Marvel had only been revived in cameo form in the mainstream Marvel universe, and the Destroyer had been revived not as his Golden Age identity of Keen Marlowe, but as John Falsworth / Roger Aubrey. 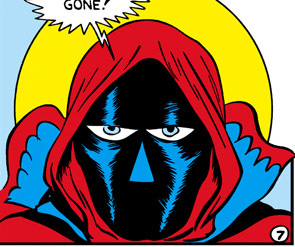 The cartoon turned this on its head - it gave powers to the Thunderer that he never had in the comics, restored Keen Marlowe to his place as the Destroyer...and instead changed the true identity of the Black Marvel. In the cartoon, the Thunderer was voiced by Hansford Rowe.